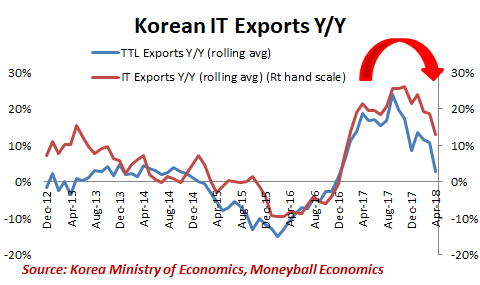 Over the past few months, I have been pointing to slower growth coming out of Asia (i.e. China) and the E.U. (i.e. Germany). We can track the slowdown by looking at semiconductors and the overall supply chain. These two factors give us an insight into how it could affect future Central Bank decisions. China’s dependence on industrial production and exports. For over two decades, China has been following the post-World War II Japanese playbook for achieving economic growth: exports. It is achieved by dominating high-volume manufacturing and is enabled by (1) market protection, (2) intellectual property theft, and (3) currency manipulation. 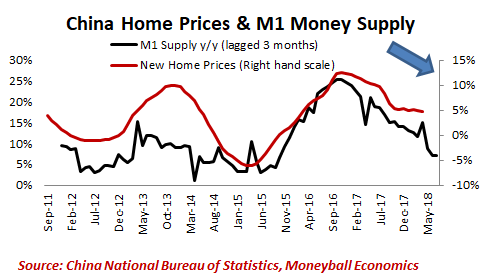 At the same time, domestic infrastructure consumption is boosted. Now comes the difficult part. Multiple waves are hitting. The soft landing for such a big country economically will be tough. Domestic demand is slowing – the big projects are done and the white elephant projects are limping along. China has entered the Japan desperation stage where cementing over rivers is the only way to achieve growth. Export growth is low and is set to slow. 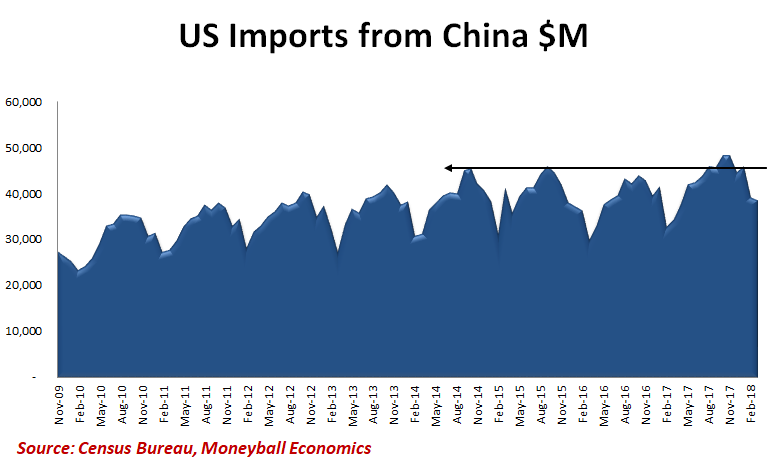 Exports from China to the U.S. are up a mere 5% in the past 4 years. And that’s after taking into account the surge in demand for smartphones. What this means is demand is actually dropping for other made-in-China products. What’s worse for Chinese exports is demand for smartphones are now slowing. In a way, this could be China’s Achilles heel as smartphones now account for ~30% of the growth in Chinese exports to the U.S.
China’s debt has gone from 140% of GDP to 280% over the past 10 years. It’s still growing. It compares with the U.S. and other mature economies, except that China lacks an equivalent purchasing parity. They borrowed trillions of debt, but the debtors can’t pay it off. Soft or hard landing? Never in history has a country taken on so much debt in such a short time without there being a hard landing. China can do their best to try. The strategy underway is simple: pop the debt bubble but avoid a hard landing by boosting export growth. That’s where the One Belt One Road comes into play: Chinese government loans will enable domestic producers to acquire growth in nearby countries. It doesn’t matter if Pakistan can’t pay back for the roads and bridges and solar power stations. What matters is that for at least the next 5~10 years, the Chinese producers are kept busy. Part 1 is underway: slowing domestic growth. 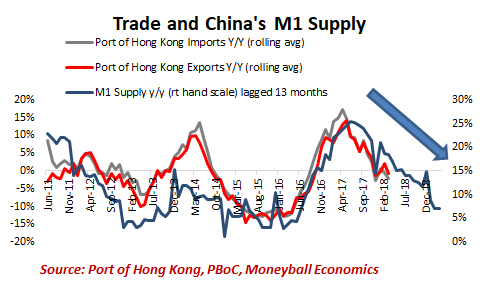 As the PBoC slows the credit growth (M1 supply is now growing in single digits), growth is slowing. For example, Imports and Exports have fallen from +15% year/year to -5% year/yr. It’s still falling. In fact, the glory days for China exports are probably over for now. 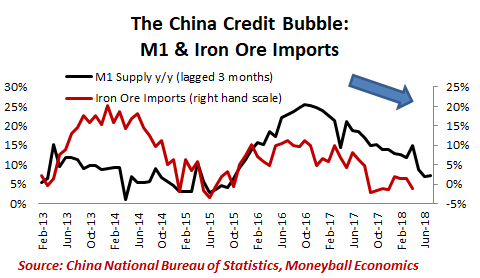 The squeeze by the PBoC is similarly cooling imports: Chinese iron ore demand continues to track the drop in credit growth. Indeed, the cooling effect of the engineered soft landing is visible in domestic consumption. Home price growth continues to slow in lockstep with the tightening credit. Another example of cooling growth: Retail spending growth has slipped from 12% y/y to 9% y/y. A couple weeks ago, Applied Materials (AMAT) guided down 2018 revenues. From an expected 20% to around 16%. Still healthy, but the market hates slower growth. I’d consider this the trickle in the dam. Why slower semi sales matters: Semiconductors are the universal common denominator in all goods and services. Facebook runs on servers. Cars are made with chips inside. And APAC demand is at the center of global production. APAC semiconductor demand is a proxy for global macro growth. Growth is slower than appears. Thanks to cryptocurrency mining, the past year has seen a boom in demand for semiconductors. But it is still a slowing market. Strip out the crypto boost, and growth is much slower than perceived. Applied Materials (the world’s largest maker of semiconductor manufacturing equipment) essentially signaled that business is set to slow even faster. Bottomline, it means that Q4 is looking shaky for delivering the goods on global growth. 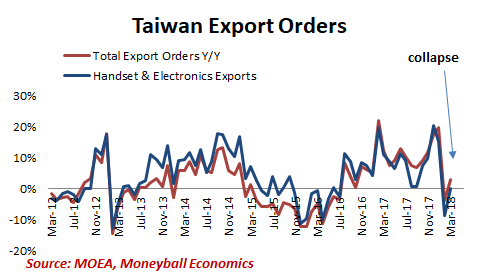 Taiwan and South Korea depend on exports, especially high tech exports (especially to China). They have both collapsed as a result of China’s own problems. For Taiwan, the impact on Industrial Production has been profound – IP growth has again started to stall. What's Next for Central Bankers? If macro growth is synchronized, then for APAC it is moving down in step with China’s slowdown. Central Bankers in these countries must balance capital flow concerns with the impact of higher rates on macroeconomic growth. China will move to unlock other forms of financial support. Like relaxing reserve requirements. Or inviting foreign banks into the banking sector (the better to move bad loans off their books).